Our home is covered with our own art. Not because we are particularly vain, but because we have more wall than closet space in our house. This is why it is especially refreshing to have the privilege of owning artwork by others. We, as a family, believe in the power of the arts and desire to invest in the work of artists. Though being a starving artist family ourselves poses a challenge, on occasion we thoughtfully splurge to add to our slowly growing collection. I have been a fan of the Romanian Sculptor, Liviu Mocan, for quite some time. It was mostly coming across his personal story that drew me further into appreciating his artwork. He creates from his core, from a very human place yet dripping with faith. He inspires me as an artist and a person. Having such a high regard for him, made it all the more significant when my husband came home from a recent trip abroad where his path unexpectedly crossed with Liviu’s at an art conference. Knowing how much I respect Liviu, and how hard it was to sit this trip out due to family responsibilities, my husband blessed me with the purchase of a one-of-a-kind souvenir and our first sculpture to add to our art collection. Art makes such wonderfully meaningful gifts, especially when personal interaction with the artist is included in some way. 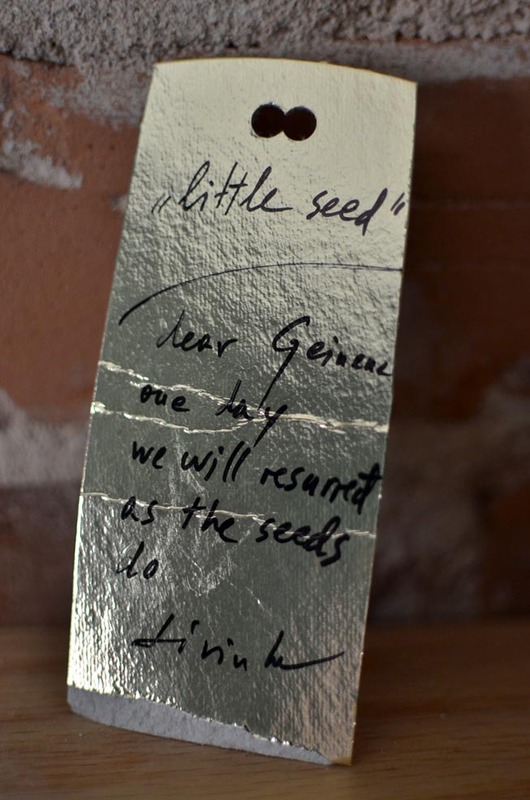 So this is a shout out to Liviu in appreciation for creating the artwork, The Little Seed, that now adorns our home and expresses hope through the metaphor of the seed. I am also grateful for the personal note of encouragement included.